The Jenkins’ Split hopper barges have worked at Peterhead previously for Boskalis several years ago for a similar harbour improvement project. 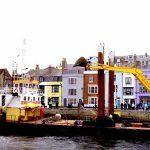 Dredging Contractors Boskalis Westminster are responsible for ongoing dredging operations in the busy port, where they are deepening existing harbour areas, requiring a large backhoe dredger to excavate the bedrock. The ‘NAB’ and ‘NEEDLES’ were selected as they are the optimum size for working around the restricted harbour. They are also assisted by their excellent manoeuvrability. 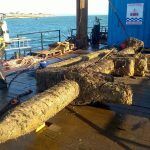 The hoppers have been fitted with custom made hardwood protective matting to protect them from damage while being loaded and unloaded with the rock spoil. 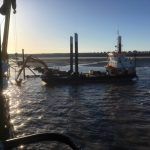 They are being loaded by backhoe 60m x 18m ‘MP40’, then transiting the harbour to an offloading quayside, where an 80t excavator digs the rock back out. From here the rock is then loaded into dumper trucks ashore and delivered to a deposit site nearby where a new quayside is being constructed, and the rock is being reused as backfill. Works are continuing 7 days a week, 24 hours a day and commenced in May. The expected completion date is later in Q3/4 2017.